Grand Theft Auto 2, or GTA 2, is the second major installment in the Grand Theft Auto series. It was released worldwide on October 22, 1999, by developer Rockstar North (then known as DMA Design), for the PC and PlayStation. A version for the Dreamcast console was made available, and later a toned-down version for Game Boy Color. The game is also available for download for the PlayStation Portable. The PC version of the game is now available for free download here, along with Grand Theft Auto 1, and another Rockstar game, Wild Metal: Reclaim the Future. However, this requires the registration to Rockstar Games' mailing list. Although it is not the original game, it has been remade to work on modern Windows operating systems. 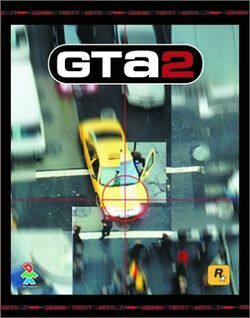 There are some differences between GTA2 on each system, as the PlayStation 1 version is only available in the "noon" setting, which means it's only daytime, and features less lighting from explosions, streetlights and headlights, the Dreamcast version is only available in the "dusk" setting, which means that the environment is much dimmer, and the PC version has the option to play the game in either noon or dusk. These choices were made to exploit the particular technical qualities of each game system. The PlayStation 1 version of Grand Theft Auto 2 is toned down from the PC version, with lower quotas for the number of kills needed in rampage style missions, and containing no voice acting in the saving interface. The port also includes a feature where the player car will explode after the player kills a large number of gang members. One mission was also changed. Instead of the player tricking civilians into entering a bus to drive them to a meat processing plant to be cannibalized, the victims are Hare Krishna gang members. The protagonist's name is Claude Speed. The game takes place in Anywhere City, which is divided into 3 sectors - Commercial, Residential and Industrial. In each of them there are three gangs, whose bosses give the player missions via payphones. Each district also has a maximum wanted level that the player can acquire, likely to make later levels more difficult. The Commercial District allows a maximum wanted level of four, which results in the S.W.A.T. team chasing the player, however, the Residential District bears a wanted level of five, with F.B.I. agents pursuing the protagonist, and in the Industrial District you can obtain maximum wanted level of six, so the Army will chase Claude. Rednecks (symbol: the Confederate flag) - Led by Billy Bob Bean, they appear in the second area, are rabid fans of Elvis Presley, and specialize in explosives and vehicles. Their business is the brewing, running and selling of moonshine . Their car is a wide Pickup truck. The Rednecks' turf is the trailer park at the northwest of the Residential Area. Their gang color is light blue. Yutes (symbol: unknown) -They are a small gang that is considered to be the weakest in Anywhere City.They appear in the Downtown District dressed the same way as the Loonies but there only appearance is in the mission Yutes Must Die! after this the gang is not seen or mentioned again in the game.The only known members are Lefty and the unnamed leader their gang cars are black Sharks and they seem to be allies with the Yakuza as killing Yutes, may cause you to lose Yakuza respect. The PS version of the game is rated T by the ESRB, the only GTA game with such a rating. GTA 2 was the only game in the series that featured articulated trucks, until Grand Theft Auto: San Andreas in 2004. This is currently the newest GTA game in chronological order, with Grand Theft Auto: Chinatown Wars right behind it. Despite the fact that the game is set in 2013, it features cars from the sixties and the seventies.